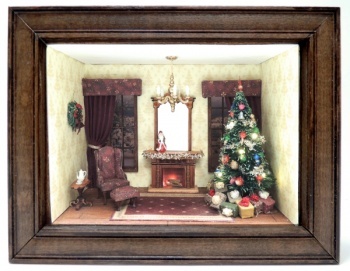 Celebrate Christmas with this beautiful 1/4 scale Christmas roombox. This project was modeled after m 1/12 Della Robia Christmas Roombox, without the fruit! The interior of the box measures 4 1/4" x 3". It has a false back wall that allows the viewer to see out the windows to a beautiful winter snow scene. An elegant cherry wood fireplace is lit and the embers are glowing. The wood floor is warmed by a lovely floor rug. A comfy wing chair is covered in a festive Christmas silk fabric, and has a matching footstool to rest the feet after a long day of Christmas shopping. A cherry wood table sits beside the chair, with a teapot and cup and saucer. The best part of this box, however, has to be the tree. 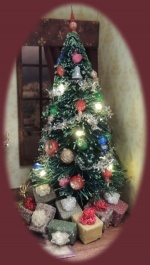 Lighted with tiny led bulbs, draped with garland and then decorated with 25 authentically shaped 3D printed ornaments, it is truly the most detailed 1/4 scale tree ever. Loads of tiny wrapped packages are piled beneath the tree. A 3d printed chandelier hangs from the ceiling, (Not working). The lights, (fireplace, tree and outside illumination lights) are all powered by a coincell battery, which is cleverly hidden below the room, There is an on off switch on the back side of the box for easy acccess. The front of the box is covered with a plexiglass insert and frame, to keep out the dust bunnies. In this class, students will construct the box, add wallpaper, windows, stain flooring. They will make draperies and cornice boxes (drapery fabric will come pre pleated so you do not have to purchase a pleater for this project.) Then they will assemble and upholster wing chair and footstool, and assemble and wire the fireplace. Finally they will wire and decorate the tree, and wrap packages. Lots of fun new techniques. Basic tools and a razor saw and miter box are required as well as paints, glues and stain. We would like to have these kits all shipped by the 15th of December. To do so, we have to shorten up the registration window. To encourage early registration, so that we can order in the necessary supplies, we are offering a $5.00 early bird registration discount to all students who register by December 6. Be sure to look at the additional photos below and if you have any questions, drop me an email.